Published: May 1, 2011 at 07:12 p.m. The commissioner would still have a role as the official greeter. 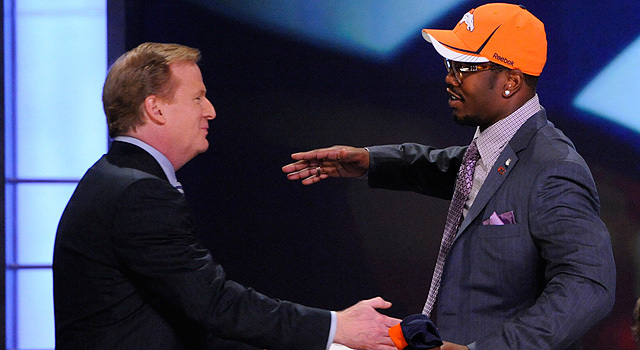 The 2011 NFL Draft is in the books and what a time it was. Cam Newton goes first overall. Jake Locker and Christian Ponder go much higher than expected. And Ryan Mallett and Da'Quan Bowers go into free-fall. I hope you all enjoyed the draft. While it was a blast, however, there is no reason to believe that we can't make it any better. Not in a "Greedo shoots first" kind of way. Rather some tweaks or improvements to make the greatest late-April sporting event even better. Imagine how much more intrigue there would have been in this year's draft if a team was able to select the rights to Andrew Luck to hold on to for next year? At what point would you pass on a potential impact player for this year and look for the future? And how bummed would you have been if you had taken Jake Locker last year? Well, unless it was the Titans. Three hours is fine for a Quentin Tarantino movie, but the draft should move a touch faster. Cutting the time between picks from 15 to 10 minutes has been gold. A further cut not only speeds up the pace, but also forces teams like the Falcons to panic and consummate this generation's version of the Herschel Walker trade. The NFL draft has been an institution in New York, but with the Big Apple finally getting a Super Bowl, it's time to let other cities have the draft. Green Bay, Chicago, and Dallas all deserve a shot. Well, maybe not Dallas, lest it run out of seats again. But other fans should be given the chance to lustily boo their team's selection for no reason. Imagine a draft held in Philadelphia. How has this not happened yet? Bring back the eighth round but with one caveat -- let the fans make the selection. When you look at the success rate of the undrafted free agents, the fans have just as good a chance of getting one right. Plus, each team can figure out a way to pick its picker â¦ season-ticket holder, contest winner, raffle it off -- whatever. The best part? Having the team's GM and personnel department boo the fan's selection. Turnabout is fair play. Imagine how much more compelling the first-round would have been if the NFL had lined up the top six prospects on stage an hour before the start of the draft, and then started eliminating players once every 10 minutes until the first overall pick was revealed right at the top of the hour. "Marcell Dareus â¦ you can sit down because you, Cam Newton, are the first overall selection." This isn't a response to the commissioner getting the Vickie Guerrero treatment during the draft. No disrespect, but when the draft moved to prime time, the league made the draft a real entertainment event. And in that case, you need a real host. And who better than Gervais? Especially if you give him a few belts and some freedom to comment on the picks. Imagine Gervais saying, "With the first pick, the Panthers select Cam Newton â¦ pity, too, because he will now earn less than he did when he was playing at Auburn." Of course, if you want the commissioner on hand to give out hugs and handshakes, well, I guess that's fine. "Who said it: Rex Ryan or a movie coach?..."